Obituary for John Covington Morris Jr. | Cronrath-Grenoble Funeral Home, Inc.
“Johnny,” he was born in Meridian, Ms. on Nov. 15, 1936. Johnny was the only son of John C. Morris, Sr. and Ruth Martin Morris of Morgantown, Ky. and Logansport, Ky., respectively. John graduated from the U.S. 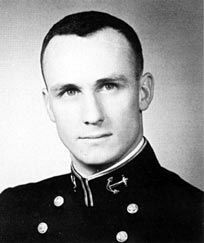 Naval Academy in 1961, where he sang in the Glee Club, captained and lettered in lightweight crew, and graduated with a General Engineering degree. He then was commissioned as a 2nd Lt. in the U.S. Marine Corps and became an infantry officer. During 6 ½ years of service, John was stationed at Camp Pendleton in the 1st Marine Division, then the Recruit Depot in San Diego. John met his PanAm stewardess wife, Brenda, on a blind date for the Marine Corps Ball; they were married on May 28, 1966, just four months before John deployed to Vietnam. Captain John Morris then served as a company commander in Vietnam for 13 months in 1966-1967. John then began a 28-year banking career in New York City and Connecticut and in 1996 moved to Alexandria, Va., where he worked for a patent law firm. In 2003, John retired, and he and Brenda moved to Portland, Or. This past summer, they moved back East to Maryland to be near family and friends. Johnny’s interests included spending time with family, traveling to visit family and friends, hiking, reading, and volunteering. A man of strong faith, he was devoted to his kin, and keenly interested in his family history, researching widely. John was an avid reader, especially of history. He was active in church and community service–in scouting, in civic organizations, as a Presbyterian elder, and in PTA. Most recently, while living in Portland, John and Brenda accumulated over 4,500 volunteer hours in the Menucha Conference Center’s gardens, a mission of Portland’s First Presbyterian Church, where they were members. He served on the Menucha Commission and the Friends of Menucha Foundation Board of Stewards (twice as President), and was the co-leader of the Hillsdale Neighborhood Emergency Team, helping to train neighborhood volunteers to respond to natural disasters. John and Brenda were devoted members of the Friends of the Columbia River Gorge, leading and trailing nature hikes. Johnny’s father, John C. Morris, Sr., was the eldest of 12 children of J.N. and Edna Berry Morris of Morgantown, Ky. Johnny is survived by his loving wife of over 52 years, Brenda L. Morris, born inEssex, England; and two sons, John C. Morris III and wife Nancy K. Morris of Kensington Md., and Jason L. Morris and wife Jane Conwell B. Morris of Oceanside, Ca. ; three grandchildren, Sophie (daughter of John and Nancy), and Holland and Conwell (children of Jason and Jane Conwell); Morris first cousins Sue James of Bowling Green, Ky.; Saundra Kay Morris of Lewisburg, Pa.; Randy, Bobby, Pam, and Roger Morris of Va., Del., and Md. ; Phelpses Ruth Scott of Beaver Dam, Ky., Dewey Phelps of New Concord, Ohio, and Betty Essex of Ocala, Fl. ; Weymouth Martin of Morgantown and Marilyn Martin Mewbron of Atlanta, Ga.; and many other Morris and Martin descendants. Johnny was preceded in death by his first cousin Norma Clark of Morgantown; other Phelps/Morris first cousins of Morgantown and elsewhere; Tommy Martin of Seattle, Wa. ; and Capt. Harreld Martin, USAF of Ohio County, Ky.
A memorial service/celebration of life will be held at the U.S. Naval Academy Chapel, Annapolis, Md. at 10 a.m. on December 28, 2018, after which Johnny will be inurned at the Academy’s Columbarium. In lieu of flowers, contributions may be made to the Friends of Menucha Foundation; P.O. Box 8; Corbett, OR 97019-0008.